We’re going back to the beach for FRU 2019!! After a year of change, we’re excited to tell you about our new home on Miami Beach for the 2019 Florida Roundup: the Eden Roc Hotel! Imagine, everything you would want: Super nice hotel, 3 pools, Cafe Inez, restaurants and 24 hour room service, uber close to South Beach, all of this right on the beautiful beach in Miami Florida. Please be advised that there are 2 different links for room reservations. Our host hotel on Miami Beach is actually two hotels, one being the original Eden Roc with rates starting at $259 a night, and the boutique hotel, Nobu, with rates starting at $309 a night. Both rates are deeply discounted for us and do not include a resort fee. 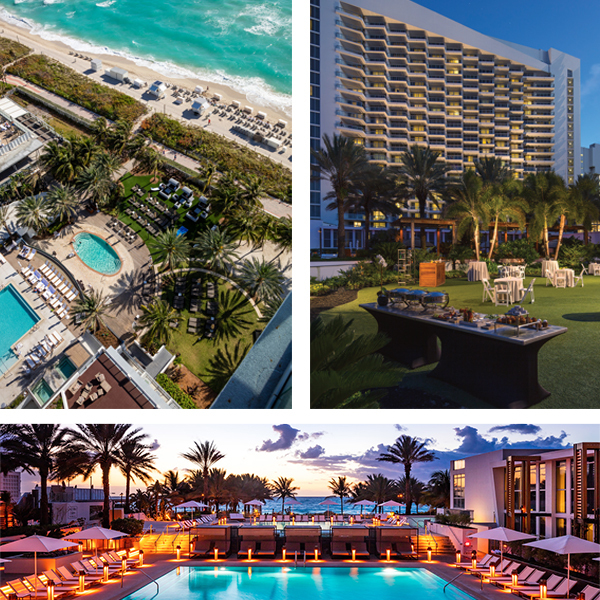 To get started with your reservation, visit Eden Roc Hotel Miami or Nobu Hotel Miami Beach. Remember: you must register with the Florida Roundup before you contact the hotel to make reservations. Once you register you will receive our group code, which will enable you to receive our group rate for your room. Please see the attached PDF for detailed information of what comes included in the pet fee. The Pet Program is $150+ per night.